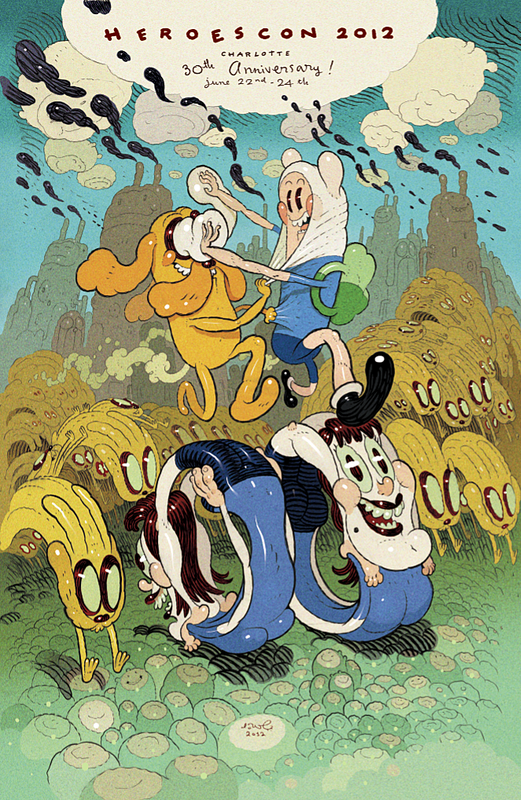 We got a great look at Adventure Time #5 covers by Chris Houghton (Reed Gunther), Eleanor Davis (The Secret Science Alliance), James Kochalka (Super F*ckers) and Mike Krahulik (Penny Arcade) and Dave Cooper awhile back, and now we're pleased to present a first look at prolific artist Paul Pope's (Heavy Liquid, Batman: Year 100) back-up story from the issue care of Boom! Studios. Arriving in stores this Wednesday, Pope's semi-psychedelic "Emit Erutnevda" tale looks as though it will add an additional pinch of magic to Ryan North, Shelli Paroline and Braden Lamb's consistently algebraic main storyline. Finn and Jake and a tie-dyed hole in time and space? It seems Pope knows just what AT fans are looking for. 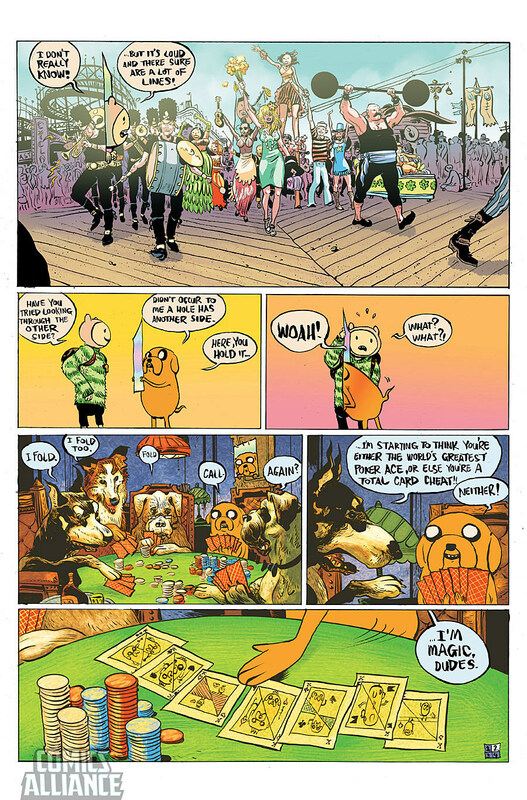 Check out our exclusive first look at two-pages from Pope's Adventure Time #5 backup after the cut. Don't miss the beginning of the new arc of this totally rhombus series! The totally sick gang of Finn, Jake, Marceline, Princess Bubblegum, and the Ice King are back in this new arc of the incredibly popular all-ages series! With the first issue going to a 3rd printing, you won't want to miss this ultra-awesome issue that kicks off a brand-new storyline! 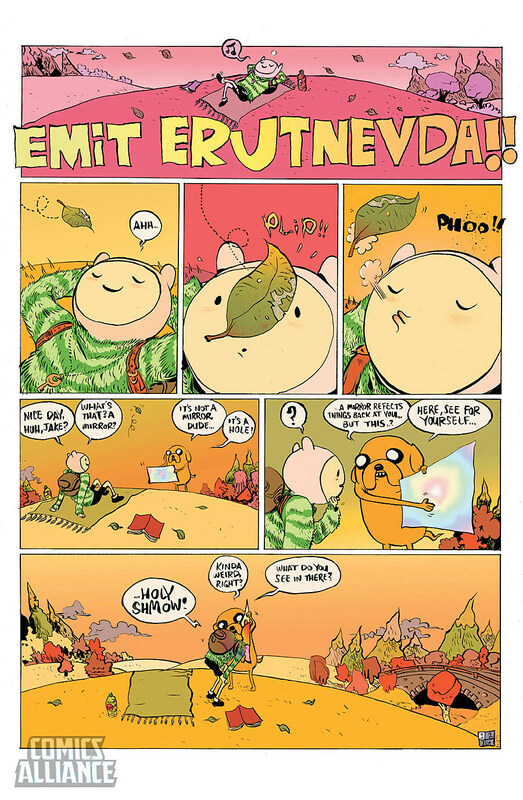 Check out two preview pages from Paul Pope's special back-up story from Adventure Time #5 below.